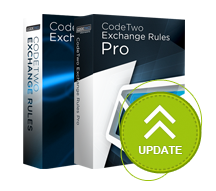 We have just released an update of CodeTwo Exchange Rules PRO and CodeTwo Exchange Rules 2013, 2010 and 2007. The latest version of the application solves the problem with adding disclaimers to emails sent from OWA after updating Internet Explorer to version 11, resulting from the new browser file format MSHTML11 . We recommend that all users of CodeTwo Exchange Rules PRO, CodeTwo Exchange Rules 2013, 2010 and 2007 download the update and re-install the program on their servers. To install the update, please download the latest version of software from our website and launch it on the server. The old version of the program will be replaced with the new one and all previous settings will remain unchanged. If you have any additional questions, please contact our Technical Support Team – we are available 24 hours a day from Monday to Friday. Download CodeTwo Exchange Rules PRO 1.4.10.0.